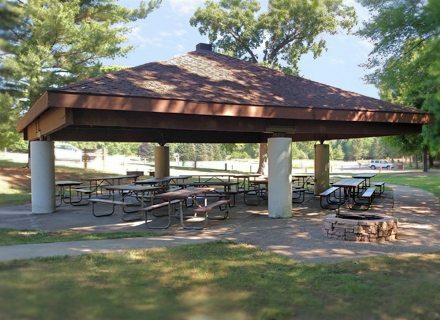 Located on the banks of the Elkhart River, Fisherman’s Camp is a handicap-accessible open-air shelter with picturesque views of the park and observation tower. The shelter includes a campfire pit, nearby playground, and electric outlets. The site also has easy access to the canoe/kayak launch, fishing sites, and hiking trailheads. Adjacent to the shelter is the lower athletic field and a volleyball pit. From the gatehouse, take the first right and continue for a quarter mile and look for the parking lot and on the right. We care about our community, and it is our mission to enhance the quality of life, preserve the County’s cultural, historical, and natural resources; and provide educational and recreational opportunities to all.